I greatly admire Miles Mathis for his mechanical principles. In all my research and theorizing, I have always insisted on a mechanical explanation. I do not allow dodges into field lines or pluses and minuses. And I have forbidden myself the luxury of attractions, since attractions are non-mechanical. I greatly admire Miles Mathis for his deconstruction of mainstream misinformation, mathematical manipulations and misdirection. To begin, let us look at the current explanation of this. Well, basically there isn’t any. If you search in books or on the web, you get a lot of useful information on unpaired electrons and domains and domain alignment and field lines and so on, but you never get an explanation of the actual force. If magnetism is closely related to electricity, and electricity is a movement of electrons, what movement of electrons causes an attraction of two macro-bodies? It is not as if one body is made up of protons and the other is made up of electrons, so we can’t even use the naïve device of charge signs to explain it. In other words, we cannot use the little pluses and minuses on the proton and electron to explain a magnetic attraction, since one body does not have more positive charge than the other, or more negative charge. And besides, we aren’t even told what charge is, so the standard model doesn’t have the tools to explain anything here mechanically. All we are shown is some field lines around a bar magnet, which prove the greater motions in the field. But what causes the motions, and what causes the lines? Overall, I consider Miles Mathis to be a leading purveyor of principles in physics. However, my personal reservations [regarding the explanations and hypothesises of Miles Mathis] are based upon the somersaults he performs regarding gravity where “all objects are expanding at a rate defined by their gravitational presence”. I have reversed all the gravitational accelerations in the universe. I have taken Einstein’s equivalence principle as a physical fact, not just a mathematical reversal or a theoretical game. I have assigned the acceleration of gravity to a real motion, not just a field inclination or a hovering gradient or a mathematical curve. i.e, their volume. Note that: their volume, not their mass. The expansion of the Earth can provide a mathematical explanation of the gravitational force that keeps objects bound to the surface [of the Earth] but it is just a magic mathematical manipulation. The concept of “continually expanding objects” results in objects having a “continually decreasing density”. This would cause, for example, sunlight to be continually diminishing [photons per square metre – emitted or received]. This is not observed. This would also result in the disappearance of objects as their density [mass per cubic metre] approached zero. The transition of objects from “solid” through “transparent” to “invisible” has not been observed. The concept of “continually expanding objects” results in the surfaces of objects “continually getting closer”. This is not observed and specifically disproved [in the case of the Sun and the Earth] unless the speed of light [from the Sun] varies in proportion to the distance between the two objects. The concept of “continually expanding objects” [based upon their “gravitational presence”] would quickly destroy the optical equivalence of the Moon [as it eclipses the Sun]. This has not been observed. The concept of “continually expanding objects” based upon their “gravitational presence” does not explain the “inverse square law” of gravity. The gravitational attraction force between two point masses is directly proportional to the product of their masses and inversely proportional to the square of their separation distance. The force is always attractive and acts along the line joining them from their center. Unfortunately, Mile Mathis was not radical enough when he looked for “firm ground” upon which he could build a new mechanical physics. It seems that he has fallen for the tricks of “the last of the magicians”. Newton was not the first of the age of reason. He was the last of the magicians, the last of the Babylonians and Sumerians, the last great mind that looked out on the visible and intellectual world with the same eyes as those who began to build our intellectual inheritance rather less than 10,000 years ago. Sir Isaac Newton was an alchemist and a mathematician. Unfortunately, Sir Isaac Newton was not a mechanic. Sir Isaac Newton (1642–1727), the noted English scientist and mathematician, wrote many works that would now be classified as occult studies. These occult works explored chronology, alchemy, and Biblical interpretation (especially of the Apocalypse). Newton’s scientific work may have been of lesser personal importance to him, as he placed emphasis on rediscovering the occult wisdom of the ancients. In this sense, some believe that any reference to a “Newtonian Worldview” as being purely mechanical in nature is somewhat inaccurate. Sir Isaac Newton is the Prince of Post-Normal [without explanation] science who pioneered the technique of “mathematical substitution” to morph mechanics into mathematical mumbo-jumbo. Unfortunately, Miles Mathis has also fallen under the warped influence of the King of Post-Normal science: Albert Einstein. I have taken Einstein’s equivalence principle as a physical fact, not just a mathematical reversal or a theoretical game. Albert Einstein was just another mathematician [theoretical physicist] who extended the magical mathematics [of Sir Isaac Newton] to conjure up General Relativity and the Equivalence Principle. 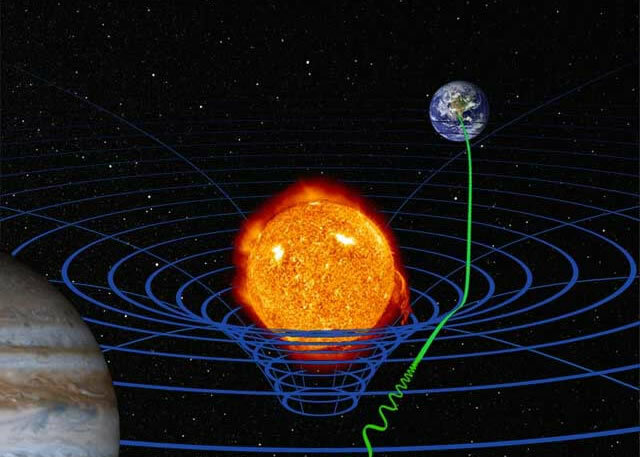 General relativity (GR) is a theory of gravitation that was developed by Albert Einstein between 1907 and 1915. According to general relativity, the observed gravitational attraction between masses results from the warping of space and time by those masses. General relativity has developed into an essential tool in modern astrophysics. It provides the foundation for the current understanding of black holes, regions of space where gravitational attraction is so strong that not even light can escape. Unfortunately, the warping of space and time is just another mathematical trick without a mechanical explanation and without any foundation in reality. Albert Einstein was not a mechanic. I hope Miles Mathis realises that Newton and Einstein produced mathematical mumbo-jumbo in an attempt to explain away the mechanics of a gravitational vortex. I hope Miles Mathis reviews the work of Howard Johnson and revises his paper on magnetism. Gallery | This entry was posted in Astrophysics, Books, Earth, Geomagnetism, Magnetism, Science, Solar System, Vortices. Bookmark the permalink. Have you any idea when that was written, it seems “old fashioned” but at the same time very up to date in materials and theory? Looks like “The secret World of Magnets” was first published in 1970. 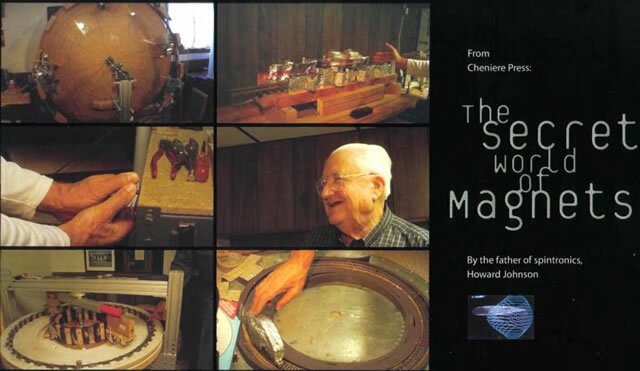 In 1970 Howard Johnson published the booklet “The secret world of magnets” which is available again now. Albert Roy Davis, Walter C. Rawls, Jr. I wonder why all physicist try to explain things based on a thing they formulate theoretically and have no mechanical basis behind it.